Home > Featured > Heads up! 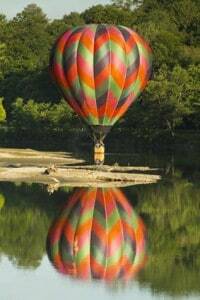 A hot air balloon casts a mirror reflection in the Ottauquechee River. John Stritzinger won first place in the 2015 balloon fest photo contest for this eclipse shot. 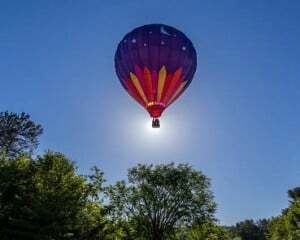 The skies over Quechee and the Upper Valley of Vermont and New Hampshire will be filled with hot air balloons ushering in the 37th annual Quechee Hot Air Balloon, Craft & Music Festival, the longest running hot air balloon festival in New England, over Father’s Day Weekend, June 17, 18, and 19. Don’t miss this exciting festival featuring up to 20 hot air balloons with five flights scheduled throughout the festival and additional tethered rides during the day. Enjoy continuous music and entertainment for all ages, and over 60 craft artisans and commercial vendors. Children’s activities include the free Kid’s Zone with Euro Bungee, a rock climbing wall, bounce house and more. There will be festival food plus local healthy options and a beer and wine garden, with more surprises on site. Gates open Friday at 3 p.m. at the Quechee Gorge Visitor Center, 5966 Woodstock Road, Quechee. Gates will reopen at 5:30 a.m. both Saturday and Sunday, with the first morning balloon ascensions taking flight at 6 a.m. Evening ascensions take place all three days at 6 p.m. Balloon rides are weather dependent. The entertainment line-up is an impressive one, featuring music acts such as Billy Wylder, Coniption Fits, Juke Joynt, James Mee, Party Crashers, and Amy & the Engine; plus dancer’s corners; “Pups in the Air;” jumping parachute demos from 10 a.m. to 3 p.m. both Saturday and Sunday; a VINS presentation; clowning shows; balloon glows at dusk Friday and Saturday; and more. See the full schedule of events in the calendar of events in this paper, or online at quecheeballoonfestival.com. Admission is $15 for adults and age 13+; kids age 6-12 are $5; and age 5 and under are admitted free. Admission is good for the entire weekend and includes festival parking. Admission does not include balloon rides, which can be purchased online or during the festival. Are we walking our talk or living a lie?